Try to hit your next jackpot this Sunday with a 100% easy win match bonus from Slots Capital Casino! Redeem the coupon code EASYSUNDAY in the casino' cashier to claim your low 20X wagering requirement match bonus and win as much as you can. You can also claim a 300% April bonus. 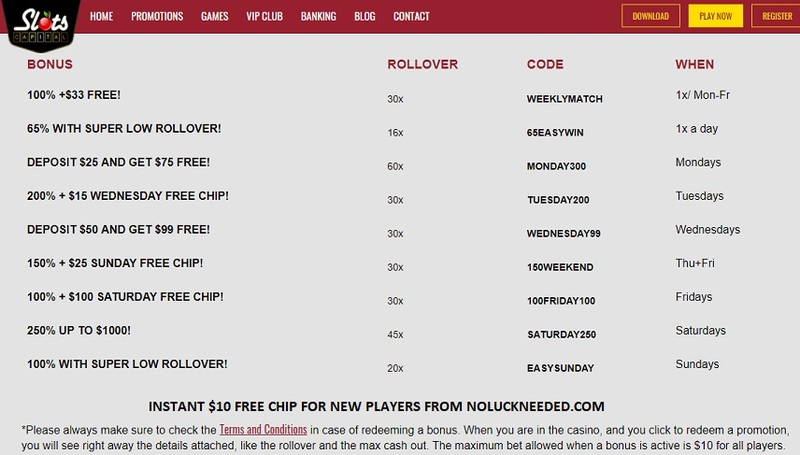 New players can claim a 1000% welcome bonus with the coupon listed below and receive an instant $10 free chip sign up bonus after creating an account via NoLuckNeeded.com. Good luck! Valid on Sundays. Terms and conditions apply. No max cash out attached. 20 times rollover (wagering requirement). Playable on Slots, Scratch Cards and Keno. Additional rules or max bet may apply, check the cashier or website. Available only until 20th of April 2019; Terms and conditions apply. Minimum deposit is $35. 35 times rollover attached to the bonus. Playable on Slots, Scratch Cards and Keno.